Yes, Paula Peck made doughnuts. It may come as a surprise but this jelly doughnut recipe is actually in “The Art of Fine Baking,” tucked away in the unsuspecting “A few breads, many coffeecakes” section. It’s a classic recipe with a base dough reminiscent of brioche. Who needs the jam filling? 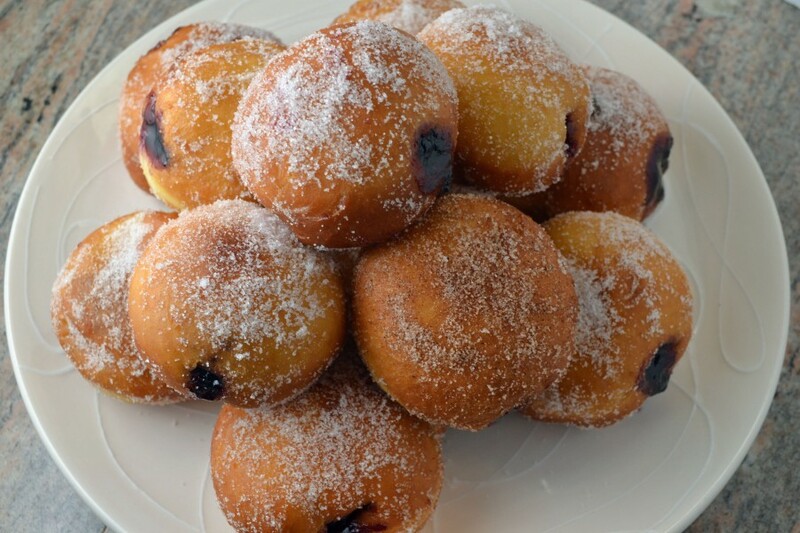 Warm fried dough dipped in sugar is enough to satisfy even the pickiest doughnut fanatics. And speaking of doughnut fanatics, it seems the once convenience store breakfast treat, often put in the same category as Dingdongs and Twinkies, has come full circle. Doughnuts have become a culinary art form (of some sort). Specialty bakeries are popping up all over, serving both traditional doughnuts as well as creative delights such as Peanut Butter and Jam, Tres Leches, and Green tea doughnuts (check out Doughnut Plant here in NYC). 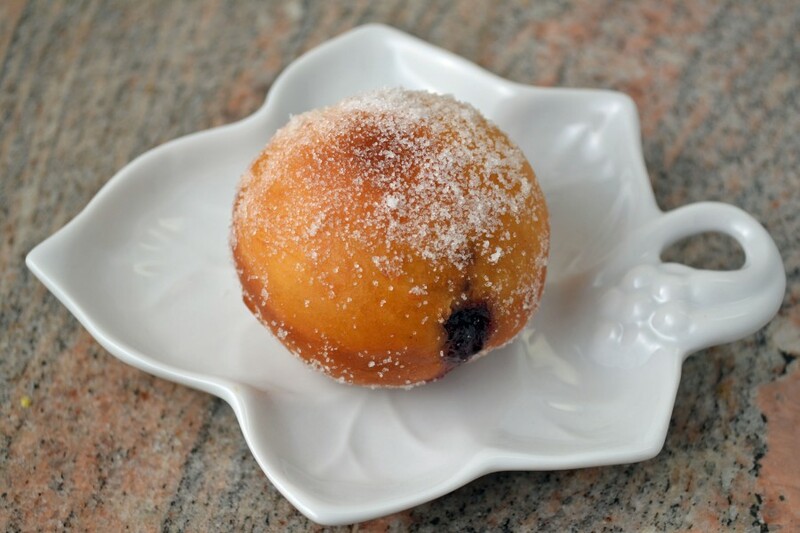 Chefs are now throwing around words like Bombolone and Beignet, which despite sounding fancy, are simply the Italian and French words for Doughnut. Even Saveur magazine recently did an article on the “Americas 50 Best Donuts“. It all comes down to one thing: one way or the other, we can’t resist fried dough glazed or dipped in sugar. This is a versatile recipe and can be made with or without the jam filling. Try filling the warm doughnuts with Nutella and you may never find a better doughnut. Mix yeast with sugar, honey, milk, eggs, egg yolks, and zest. Add enough flour to make a medium-soft dough, working in soft butter at the same time. Knead well until dough is smooth and elastic. Place dough in bowl. Dust lightly with flour. Cover bowl and place in a draft free place until dough doubles in bulk. After dough has risen, punch it down and allow it to rise a second time. Shape doughnuts by pinching off egg-size pieces of dough and forming each into a smooth, slightly flattened ball. Place on a well-floured towel and let balls rise until doubled in size. While doughnuts are rising, pour at least an inch and half of vegetable oil in a heavy bottomed saucepan and heat to 375 degrees. Drop doughnuts into fat, 2 or 3 at a time and fry until undersides are a deep golden brown. Turn and fry until the other sides are also well browned, about 5 minutes in all. Remove and drain on paper towels. When doughnuts are cool, fill them by squirting jam into their centers with a long, narrow pastry tube. Dust with vanilla sugar.